The Superman Fan Podcast: Episode #385 Part III: Superman Family Comic Book Cover Dated August 1965: Superman #179! Episode #385 Part III: Superman Family Comic Book Cover Dated August 1965: Superman #179! Download Episode 385 Part III! SUPERMAN 179, August 1965, was published on June 17, 1965. It contained 32 pages for the cover price of 12¢. Mort Weisinger was the editor, and the cover was pencilled by Curt Swan and inked by George Klein. It featured the issue's first of its three stories. - (7:28) R. I. P. Stan Lee 1922 - 2018. - (15:18) THE OUTLAW FORT KNOX (8 pgs. ), written by Leo Dorfman and drawn by Al Plastino. - (26:18) THE MENACE OF GOLD KRYPTONITE: TALES OF KRYPTONITE NUMBER 4 (9 pgs. ), written by Otto Binder and drawn by Al Plastino. This story was also reprinted in BEST OF DC 36, May 1983, released on February 3, 1983. It contained 32 pages for the cover price of $1.25. - (44:59) PRIVATE KENT, THE FIGHTING MARINE (8 pgs. ), written by Otto Binder, pencilled by Curt Swan and inked by George Klein. Next Episodes: SUPERMAN COMIC BOOKS COVER DATED AUGUST 1965 PART IV: ACTION COMICS 327 & PART V: SUPERMAN'S GIRL FRIEND LOIS LANE 59! Then we will feature: SUPERMAN FAMILY COMIC BOOKS COVER DATED SEPTEMBER 1965: PART I: SUPERMAN' S PAL JIMMY OLSEN 87, PART II: 80 PAGE GIANT 14 (featuring Lois Lane), PART III: WORLD'S FINEST COMICS 152 & PART IV: ACTION COMICS 328! 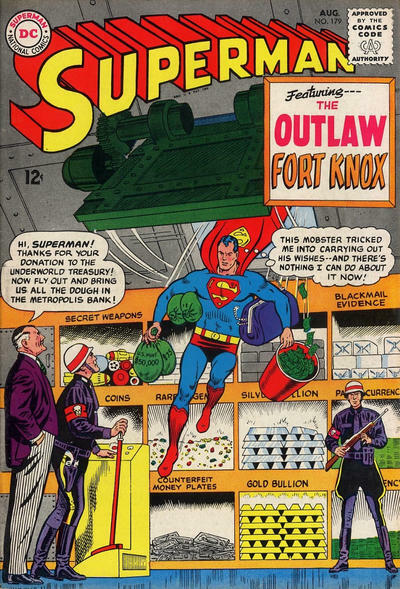 "The Outlaw Fort Knox" was a fun "Superman as Genie" story, in which we see Superman forced to grant gangster Pete Corey's wishes. Jimmy Olsen's ideas of how Superman will grant those wishes in unwanted ways mirrors the way evil genies in stories might do it, and we, as readers, are surprised to see Superman grant those wishes in a seemingly-straightforward manner. The twist at the end shows that it wasn't quite so straightforward as we thought. "The Menace of Gold Kryptonite" was a good story in the "Tales of Kryptonite" series (which, at the time, I don't think I really understood was a series). I don't remember if we ever got to see any further stories of Jay-Ree and Joenne, but I hope there are more stories of them. They made a tremendous sacrifice by losing their Kryptonian powers and exiling themselves from Kandor to preserve the genetic heritage of that city, and they deserve a happier ending than life in a doll house. "Private Kent, The Fighting Marine" certainly shows Clark's cleverness, but the positive story he wrote about Sgt. Brewster seems too much like a "puff piece" for a Drill Instructor who clearly was too harsh and unfair.